The mayor of one of Poland’s largest cities has died after being stabbed while on stage at a charity event, with the sudden incident caught on camera. Pawel Adamowicz, the leader of one of Poland’s biggest cities, has died from stab wounds a day after being attacked onstage by an ex-convict at a charity event. Polish Health Minister Lukasz Szumowski said on Monday that the doctors who were fighting to save the Mayor of Gdansk’s life informed him he had died. Mr Adamowicz was stabbed while on stage at a charity event on Sunday (local time) and rushed to hospital in a serious condition. Footage which claims to have been shot during the event, shows the incident happened in front of a large, celebrating crowd. Mr Adamowicz was attacked with a sharp tool during the “Light to Heaven” event, spokeswoman Magdalena Skorupka-Kaczmarek said. A suspect has been arrested, Mr Brudzinski saiYouTube video appears to show the moment the terrifying attack took place. People can be seen waving what look to be sparklers on stage as people in the crowd cheer. A man then jumps on stage and appears to attack Mr Adamowicz. He remains pacing on stage with his hands in the air, as music continues to play. It’s understood a knife was used in the incident. Polish broadcaster TVN claimed that the attacker shouted that he had been imprisoned under the government of Civic Platform, a party to which the mayor formerly belonged. Mr Adamowicz had no direct involvement in the man’s imprisonment.d. 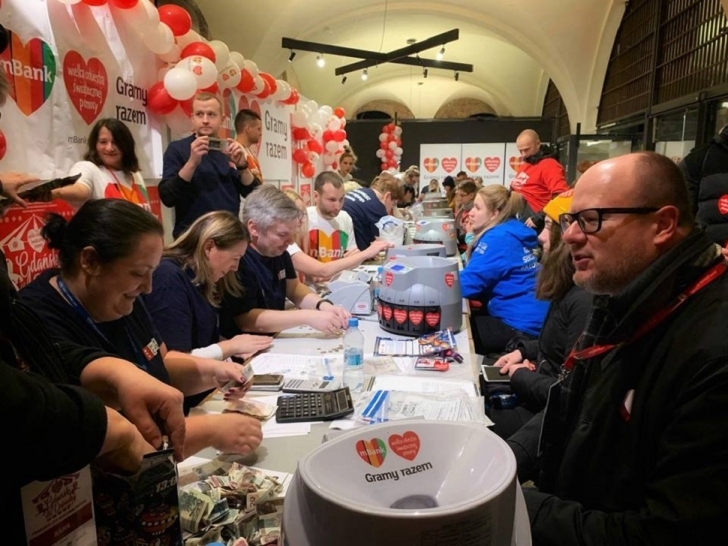 Mr Adamowicz posted just hours earlier about his fundraising efforts, boasting on Facebook that he’d raised €5,613.11 ($A8915.30) for the event. “Thank you sincerely everyone who threw money into my can and helped beat my personal record,” Mr Adamowicz wrote. Money raised at Light to Heaven was to help purchase medical equipment for children’s hospitals, the Facebook event said. Some 1200 people indicated they would attend on the event page. Comments on the video showed support for Mr Adamowicz. “Adamowicz is a man whose views are far from mine, but I wish him a quick recovery. Such things should not happen,” one wrote. Mr Adamowicz had been mayor of Gdansk since 1998. He was part of the democratic opposition born in that city under the leadership of Lech Walesa during the 1980s. As mayor, he was seen as a progressive voice and had supported LGBT rights and tolerance for minorities. Gdansk, about 3.5 hours from Poland’s capital Warsaw, is one of the country’s largest cities, with a population about 570,000. Paweł Bogdan Adamowicz (2 November 1965 – 14 January 2019) was a Polish politician and lawyer. He served as the mayor of the city of Gdańsk, Pomeranian Voivodeship, Poland until his assassination. Adamowicz was born in Gdańsk in a middle-class family. His parents Ryszard and Teresa were economists, who were resettled to Poland from Vilnius in 1946.He studied law at the University of Gdańsk, where he also became a prominent student movement member. He was one of the organizers of the 1988 strike and became the headperson of the strike committee. Between 1990 and 1993, he served as a vice-rector for student affairs at his alma mater. In 1990, Adamowicz was elected a member of the City Council in Gdańsk and held this post until 1998, when he was elected the Mayor of Gdańsk. On 10 November 2002 he was re-elected and gained 72% of votes. He was awarded with the Pro Ecclesia et Pontifice Golden Cross by Pope John Paul II and with the Cross of Merit by the President Aleksander Kwaśniewski. In 2014, he also became the recipient of the Cross of Freedom and Solidarity to honour his contributions to the democratic opposition in Poland during the Communist Period. In 2018, he provided honorary patronage over the 4th Gdańsk Homophilia Pride Parade in which he personally participated. On 13 January 2019, he was stabbed on stage by a yet unnamed male assassin at the Great Orchestra of Christmas Charity event in Gdańsk and was taken to hospital in critical condition.He died the following day from the critical wounds he sustained. The assassin was later apprehended.